This book is the most unique book I've read since the Time Travelers Wife. 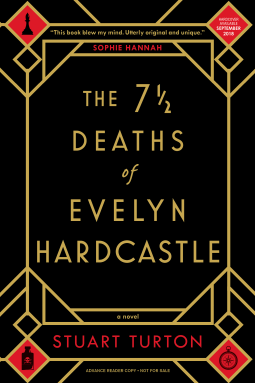 Aiden Bishop is trapped in a loop trying to figure out who killed Evelyn Hardcastle. Only he isn't the only one trying to solve the mystery. He is however the only one who is jumping from body to body and the only one who retains some sense of what happened the time before. Can he piece all the clues together and solve this? Apparently Aiden Bishop has chosen to live this time over and over in order to do something else, unfortunately Aiden can't remember what that is and with each jump he loses another piece of himself making it harder to maintain control of the body he is in and remember why he is there in the first place. This is a fresh well written story that may have your head spinning in circles but its worth every minute of confusion. Dark, atmospheric and compelling I loved that each of the people that Aiden jumps into has different strengths and weaknesses that he must utilize to solve this crime. I can't say much more without giving too much away but this book is brilliant.